Are you a new furbaby parent? Or is your cat doing something interesting you’ve been always dying to know why? Then this page is for you! Here we uncover all the reasons why cats are… cats! So sit back, and enjoy this read into what makes them so adorable. 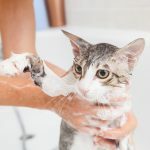 Why do Cats Hate Bath Time? One man’s trash is another man’s (or cat’s) treasure. The next time you think of disposing your boxes, stop and think of your cat. Cats in boxes are the cutest! Cats have this special fondness for boxes and little do most of us know that it helps them in improving their health and well-being. Enclosed spaces like boxes gives them a feeling of security, protection, and being in control especially when hunting for their prey. Tissue boxes are the best for this purpose. 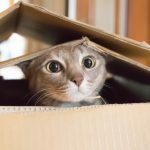 The University of Utrecht research team discovered that unlike humans, cats wouldn’t mind being boxed (literally) all day everyday. Access to boxes and hiding in them, as recorded in their journal Applied Animal Behaviour Science based on findings, makes cats more adaptable to changes (like environmental, for example) that usually bring stress to them. Decrease in stress therefore means less chances of immunodeficiency as stress causes increased cortisol levels resulting to contagious diseases, and this was observed when the researchers rated cats with and without boxes using the Kessler and Turner Cat-Stress Score in as early as the third and fourth day during their 14-day study. Cardboard boxes are perfect insulators in maintaining your cat’s body heat. A cat’s normal body temperature is higher than us humans, which is between 100.5 to 102.5°F according to TheCatCoach.com owner Marilyn Krieger. Domestic cats are most comfortable with 86 to 97°F a.k.a. 30 to 36°C, the thermoneutral zone, and human homes are normally 72°F or 22°C in temperature based on National Research Council’s 2006 study. For cats to be more at home with boxes, get them curled up with treats inside plus a towel, or if they have that #sepanx (ak.a. “separation anxiety”) with you, leave any item that has your scent on. Keep a box safe for playtime too by making sure it’s free from tape, handles and staples. Do you have the slightest idea what catnip does to cats? If you are new to a cat’s fascination with catnip, this blog post’s for you. A type of herb belonging to the same “family” as oregano and spearmint, catnip is also called catmint and it grows up to one metre in height max. Catnip toys for cats are made with either catnip leaves or catnip essential oil. Catnip gives a cat more energy as soon as it’s sniffed, licked and chewed. Catnip contact leads to more head and body movements (e.g. rolling, rubbing, shaking heads, drooling, leaping) and more purrs, ending up very playful due to that natural high lasting about ten minutes on the average. Just imagine what chocolates and coffee can do to chocoholics and coffeeholics, right? It’s not a drug and there’s no such thing as catnip overdose, yet feeding in moderate amounts are still highly encouraged. 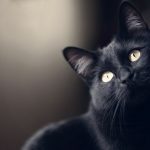 We’ve been told that cats have nine lives…yet it remains a century-old superstition. They might be the type that are strong enough to recover from a fall or injury, yet they only live once just like us. Their playfulness reminds us that it’s also a good thing to let go sometimes and pull off a #YOLO. How long do cats live? It’s 12 to 15 years on the average. Let them be and let them sleep. About 13 to 14 hours of sleep daily is what they need to keep them healthy, happy and alert. Don’t panic if you see your cats play fighting, because it’s their version of human martial arts that makes them better hunters and be more effortless in practicing self-defense. If you already know what food is best for your cat, don’t feed him or her anything that’s harmful or toxic such as chocolates (heart problems, seizures, tremors, and loss of life), dairy products (diarrhea), raw fish and raw eggs (bacteria leading food poisoning, coat problems), grapes (kidney failure), and too much liver (toxicity to Vitamin A). If you own a senior cat (aged 7 years and up), make health a top priority. To prevent bladder issues, make cranberries and celery seeds a part of your cat’s diet. Both ingredients are the secret to a better bladder, with sustained healthy levels of fluid in the body. Make litter boxes more accessible as soon as your cat experiences problems with mobility. Feeding your cat high-fiber diet regularly and keeping him or her busy with interactive toys plus a walk in the park and other activities can prevent obesity. To deal with hairballs/furballs, get a lot of natural fibers and Omega-3 fatty acids for your cat’s coat. Schedule a DIY physical checkup with your cat weekly while grooming to check for problems in teeth, eyesight and hearing, as well as the presence of bumps and lumps, apart from the semi-annual appointments with the vet. Senior cats are also easily stressed that changes in behavior become obvious, therefore let them stick to routine and the living conditions they got used to.
? Today's ?anzou?/??? ????!? 22 years old cat ? ? . 2016.10?26?(?) ? 27? . ?????15???????????????27?????? 10??????????? . ????????????? ???? ???????? 22??????????????????????????? . #cat#Chat #Katze #Gato #Gatto #??? #lovemycat#catsofworld#catstagram#catsofinstagram#catlove#catlover#catlovers#instacat#cats_of_instagram#seniorcatclub#seniorpetsofig #seniorcat#oldcat #?#?? #??#????#??? #??? #?? #???? Have you tried food puzzles? You should to keep your cat’s brain and natural instincts as sharp as they should be. 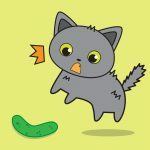 Cattime.com has named seven DIY food puzzles (with YouTube videos) that are best for cats: The Paper Towel Roll Ball, The Hole-y Container, The Puzzle Board, The Foraging Cups and Box, The Water Bottle, Bat the Bottle Feeder, and The Egg Carton. Just make sure they won’t chew on their toys to avoid choking and messing up the playroom. Take some pointers from Japanese cat owners, aside from Americans and the Brits. A 2016 report by Banfield Pet Hospital states that cats in the US have an average lifespan of 12.9 years. On the other hand, British cats have 14 years. Cats in Japan now have an average lifespan of 11.9 years (up from 5.1 years back in 1990), according to the latest study by a partnership between Tokyo University of Agriculture and Technology and the Japan Small Animal Veterinary Association, thanks to cat-friendly individuals and companies investing in vaccines, premium-quality food and medication and cat aromatherapy (yes, it’s big in Japan), keeping cats indoors most of the time, and coming up with fun activities like pet fashion shows. Longevity among cats is also seen as a trend relative to the longevity of humans in Japan, due to the increasing number of Japanese centenarians this year (65,692 as of this September).